This site is NOT A SOURCE OF "HOW TO" INFORMATION . The information on this site is an OVERVIEW of how I installed components and made modifications to MY CJ but this in no way means it will work or be safe on yours. My CJ is built as a street legal (to drive to and from the trails) trail rig and the modification are to enhance TRAIL USE ONLY. If you DO NOT have a excellent working knowledge and background in machanics, DO NOT try to modify your Jeep. If you use any information on this site, which you are welcome to, you are doing so at your own risk. Thanks for your understanding and I hope you enjoy my site. 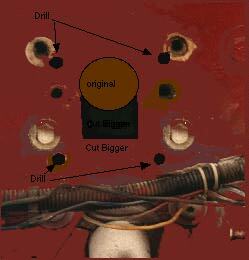 Before I start, I need to say that your brake system is, without a doubt, one of the most important systems on your rig. If it is modified incorrectly and fails YOU COULD BE RESPONSIABLE FOR THE INJURY/DEATH of yourself, passingers(family) and everyone driving near you at that time. If you do not have a professional ability in this field, DON"T EVEN ATTEMPT TO MODIFY YOUR BRAKE SYSTEM. Find a professional and pay them to do it right the frist time, its worth the money. 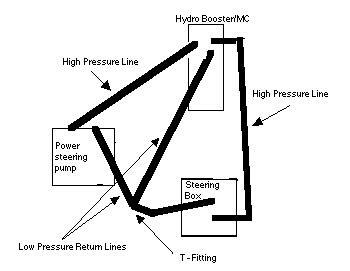 The Hydro Boost Power Brake System is a booster that works from hydralic fluid pressure produced by the power steering pump. It was/is used on many different large cars and one ton trucks. These are by far the the most powerfull brakes I've every used, able to lock up large tires with very little pedal pressure. I choose to use the '76 Fleetwood Hydro Boost booster and Master Cylinder. I choose this year and model because the MC has very large reservoirs and the fittings on the older boosters are the threaded, tappered type and not the O-ring type. This type fitting makes it easier to have hoses made, which may be necessary depending on which motor you have. I have a Chevy 350 and the hose from the pump to the booster is Cadi and the hose from the booster to the steering box is custom made. Custom hoses can be made at almost any heavy equipment repair shop and cost about the same as standard hoses so it would make sense to have both hoses custom made. (The newest hose tubing I'm using are the same as used on Case backhoes, they have an outter casing of steel mesh to protect them from chaffing). Another reason to use this model/year is the accumulator is the spring operated and not the gas operated which will leak over time. The accumulator stores enough pressure to operate the brakes one or two time after the engine stops, usefull if you stall on a hill. After the accumulater pressure is used, YOU WILL STILL HAVE BRAKES, but they will feel like manual brakes, you will still be able to stop with the engine off. For some reason some people say this is not true but I've observed, these are people that have never used this system, go figure? This conversion should only be done to a brake system that can handle the added pressure that the booster applies to lines and seals, I used this system on a stock '77 cj5 brake system for 3 years without problems but I would suggest replacing the soft lines with Braded Stainless Steel lines with a high pressure burst rating and rebuild all slave cylinders or replace them with new ones. I now use this booster with a complete one ton brake system(one tons came with the Hydro boost as an option) with added rear discs. The rear disc require repumbing the hard lines with a proportioning valve to the rear and removal of the stock metering valve and residual pressure valve. Like I said at the top of this page, IF YOU DON"T KNOW WHAT YOUR DOING, DON"T DO ANYTHING TO YOUR BRAKES, let a pro do it for you. .
Now the firewall, removed the old MC and the top, two bolts that hold the pedal assemble. The hole in the firewall for the MC must be lowered 2" for the booster to fit. After the hole is inlarged, position the booster/MC into the firewall and mark the mounting holes of the booster on the firewall. Drill the four mounting hole(note the top two hole will got through the firewall and the pedal assemble mounting bracket. The pushrod that connects the booster to the pedal will need to be drilled out about 1/16th" larger to fit the clevis pin on the pedal arm. Now you can bolt it up. With the mounting plate for the Cadi, the booster/MC will be slightly off level. This is not a problem, the reservoirs are very large and work fine. Now all I needed to do is bleed both systems (DON'T mix up the fuilds) and now I'll be able to stop those big tires !! !